Lesson Learning from Two Agribusiness Finance Pilots An investigation of pilots using value chains to finance and support small farmers F Bennett and J Swainson Enterplan Limited, Reading, UK Drum. Net Supply Chain Links, Kenya Zyonse All-inclusive Product, Zambia • • Objectives of the Pilot: Increase smallholder farmer incomes by: directly linking key players along the supply chain - buyers of agricultural produce, commercial banks, smallholder farmers and retail providers of farm inputs - through a cashless credit program and integrated marketing information and payments system; and enabling farmers to (better) access the formal, commercial banking system by building up a credit history and rating. • Legal Structure: Drum. Net is a project of Pride Africa (PA), a U. S. 501 -c-3 Company registered in Washington, D. C. The name Drum. Net has been registered worldwide by PA as a trade name. Target Client Base: Unbanked farmers with up to 2 acres, typically growing a mixture of subsistence and cash crops, with a focus on women farmers (69% of economically active women are subsistence farmers compared to 43% of men). Target outcomes: Achieve operational self sufficiency in three years; become a commercially viable business owned by its participants in five years, reaching up to 1 m clients throughout Eastern and Southern Africa; demonstrate that Drum. Net is a commercially viable proposition that can be widely replicated. Start/end date of pilot operations: October 2003 / none specified. Reporting obligations to CGAP ended in 2006. Sponsors: PA has been the sole sponsor of Drum. Net to date. PA is a well known MFI in East Africa, and to date has acted as the Bank to provide credit to the farmers involved in the pilot. PA has secured the services of specialist staff through the United States Peace Corps. Key Constraints Addressed by this Pilot: Smallholders are largely excluded from export and major domestic markets because they lack direct links with buyers/exporters, so they are dependent on low prices from local traders. It is too expensive for buyers to deal directly with smallholders, but they find traders unreliable as to quantities, quality and delivery times. Buyers face increasing traceability and other regulatory requirements governing exports (EUROPGAP stipulates traceability of product to the growing field and information on phytosanitary conditions). Buyers therefore tend to source all commercial crops from in-house and large scale production. How it works: The Visa credit card system served as the initial business model for Drum. Net system relies on a series of contracts between Drum. Net and the 4 stakeholders in the supply chain: producers, buyers, input suppliers/stockists and banks. Buyers and producers are at the centre of the proposition. A Farmers Group brings together 20 -100 farmers in the same area around 5 20 Transaction Points and is organised into clusters of at least 5 members each, which are self-selected and which cross-guarantee one another. A Group contracts to produce the variety of crop and to follow agronomic practices set by the Buyer. Individual farmers who do not meet their contractual obligations are ejected from the Group. Each Group opens a bank account with the participating bank through which all payments can be made electronically. Each member contributes to a Transaction Insurance Fund (TIF) of 25% of loans, held in the bank as security for the loan. The Transaction Agent (TA) is elected by and serves a number of groups and is approved and trained by Drum. Net to supervise each Transaction Point. The TA is the main point of contact between Drum. Net and farmers. The Buyer provides the market opportunities and contracts with farmers through Drum. Net for production, harvest and transportation. Stockists provide inputs (seed, fertiliser) to the Buyers specifications. The Bank provides production loans (provided to farmers in the form of inputs) against the TIF security and are repaid from crop sales. Drum. Net provides the ICT platform through which all financial transactions take place and the communications platform, using mobile phones, SMS and email, that enables all parties to do business together. Drum. Net negotiates contracts between producers and buyers and, through the TAs, ensures farmers follow the requirements of the Buyer. All payments from Buyers flow through Drum. Net’s accounts at the bank. Major Findings: Drum. Net has operated for about 3 years and appears to have successfully brought together most key players in the supply chain for the crops concerned, to their mutual benefit. Commercial viability is still to be determined. Conclusions: The design, build and implementation of the Drum. Net platform continues to be work in progress. Although core elements of the platform have been built and tested during the pilot, in particular the communications and payments functions have yet to be finalised. These will drive the organisation structure to be put in place and determine the financial viability. Drum. Net itself should confine itself to its core facilitation and linkages role and not become directly involved in the transactions themselves or take on any stakeholder role (as happened in the pilot). The prospect of commercial viability for the role of supply chain finance facilitation is one that deserves the close attention of donors. • • • • • • • • • • • • • Objective of the Pilot: Refine and pilot an all-inclusive (“Zyonse”) financial product to allow unbanked smallholders access to production credit. As envisaged, the package would be marketed through banks and other financial institutions that provide production credit and would consist of: rainfall-indexed crop insurance; production credit from financial institutions (including the crop insurance premium); certified warehouses for crop storage to allow farmers to take advantage of increased prices post-harvest; an option to purchase fertiliser through affiliated input suppliers on credit; and collateralisation of produce through the existing warehouse receipts system. Legal structure: Project partners include commercial banks, insurance companies, farmers groups and Government bodies in Zambia. No new legal entity was formed. Zyonse is not a registered trade name and is not copyright. Target client base: All farmers, primarily smallholder maize farmers (less than five hectares) with limited or no access to production finance. Target outcomes: The main objective of the pilot was to raise small farmer incomes through improved access to finance and enhanced marketing options. Start/end date of pilot operations: 28 May 2004 / 31 December 2006. Sponsors: The World Bank Commodity Risk Management Group (CRMG), CGAP, DFID and Ford Foundation. This pilot builds upon a warehouse receipts program funded by the Common Fund for Commodities with co-financing by USAID, the Dutch Government and IFAD together with the Government of Zambia. Key Constraints Addressed by this Pilot: Smallholder maize farming is characterised by low yields (average 1. 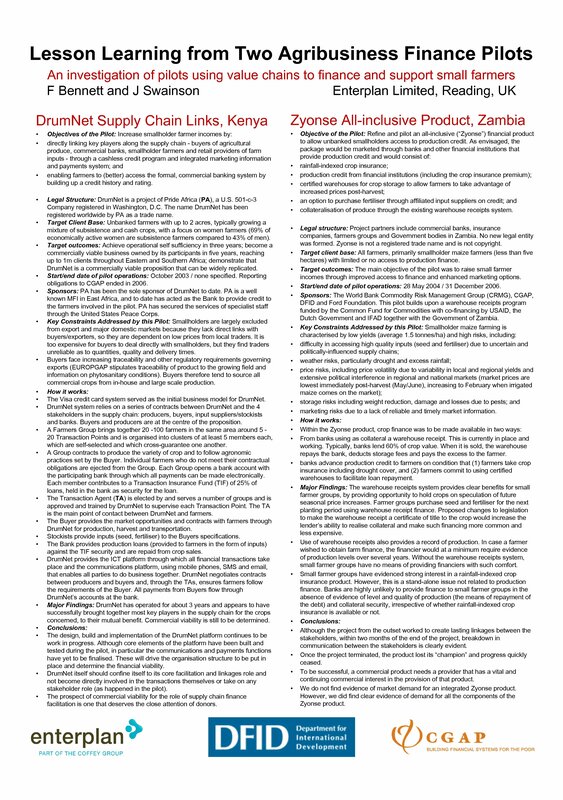 5 tonnes/ha) and high risks, including: difficulty in accessing high quality inputs (seed and fertiliser) due to uncertain and politically-influenced supply chains; weather risks, particularly drought and excess rainfall; price risks, including price volatility due to variability in local and regional yields and extensive political interference in regional and national markets (market prices are lowest immediately post-harvest (May/June), increasing to February when irrigated maize comes on the market); storage risks including weight reduction, damage and losses due to pests; and marketing risks due to a lack of reliable and timely market information. How it works: Within the Zyonse product, crop finance was to be made available in two ways: From banks using as collateral a warehouse receipt. This is currently in place and working. Typically, banks lend 60% of crop value. When it is sold, the warehouse repays the bank, deducts storage fees and pays the excess to the farmer. banks advance production credit to farmers on condition that (1) farmers take crop insurance including drought cover, and (2) farmers commit to using certified warehouses to facilitate loan repayment. Major Findings: The warehouse receipts system provides clear benefits for small farmer groups, by providing opportunity to hold crops on speculation of future seasonal price increases. Farmer groups purchase seed and fertiliser for the next planting period using warehouse receipt finance. Proposed changes to legislation to make the warehouse receipt a certificate of title to the crop would increase the lender’s ability to realise collateral and make such financing more common and less expensive. Use of warehouse receipts also provides a record of production. In case a farmer wished to obtain farm finance, the financier would at a minimum require evidence of production levels over several years. Without the warehouse receipts system, small farmer groups have no means of providing financiers with such comfort. Small farmer groups have evidenced strong interest in a rainfall-indexed crop insurance product. However, this is a stand-alone issue not related to production finance. Banks are highly unlikely to provide finance to small farmer groups in the absence of evidence of level and quality of production (the means of repayment of the debt) and collateral security, irrespective of whether rainfall-indexed crop insurance is available or not. Conclusions: Although the project from the outset worked to create lasting linkages between the stakeholders, within two months of the end of the project, breakdown in communication between the stakeholders is clearly evident. Once the project terminated, the product lost its “champion” and progress quickly ceased. To be successful, a commercial product needs a provider that has a vital and continuing commercial interest in the provision of that product. We do not find evidence of market demand for an integrated Zyonse product. However, we did find clear evidence of demand for all the components of the Zyonse product.